CHICAGO – In our latest edition of HollywoodChicago.com Hookup: Film, we have a VIP prize pack for 10 lucky winners for the new film “Daybreakers”! The film stars Ethan Hawke, Willem Dafoe and Sam Neill. Each prize pack includes an aluminum water bottle, mini poster and B+ Blood Bag energy drink. 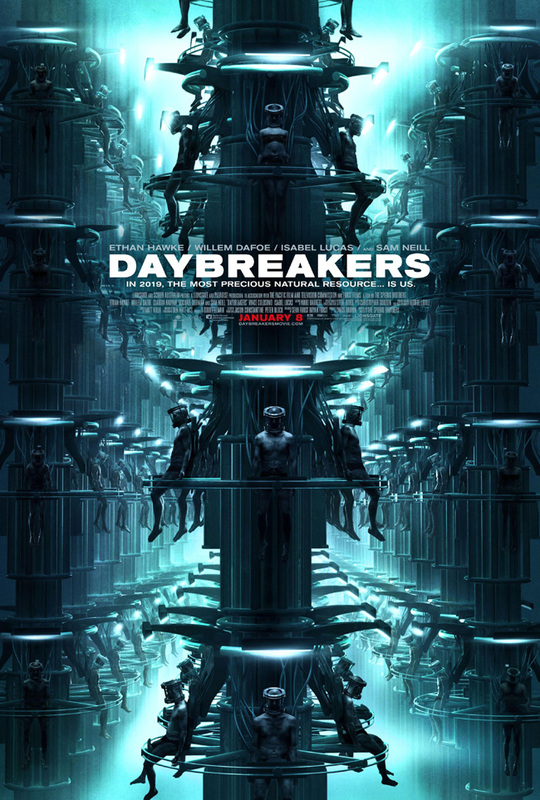 “Daybreakers” also stars Isabel Lucas, Christopher Kirby, Robyn Moore, Troy MacKinder, Michael Dorman, Charlotte Wilson, Emma Randall, Mungo McKay and Claudia Karvan from writers and directors Michael Spierig and Peter Spierig. To win your free “Daybreakers” prize pack courtesy of HollywoodChicago.com, all you need to do is answer a question in this Web-based submission form. That’s it! “Daybreakers” opened on Jan. 8, 2010. Directions to enter this HollywoodChicago.com Hookup and immediately win can be found beneath the graphic below. The movie poster for “Daybreakers” with Ethan Hawke and Willem Dafoe. Lionsgate takes vampires in a new direction with the futuristic sci-fi thriller “Daybreakers”. The year is 2019. A mysterious plague has swept over the earth and has transformed the majority of the world’s population into vampires. Humans are now an endangered, second-class species. They’re forced into hiding as they are hunted and farmed for vampire consumption to the brink of extinction. It’s all up to Edward Dalton – a vampire researcher who refuses to feed on human blood – to perfect a blood substitute that might sustain vampires and spare the few remaining humans. But time and hope are running out – that is, until Ed meets Audrey: a human survivor who leads him to a startling medical breakthrough. Armed with knowledge that both humans and vampires will kill for, Ed must battle his own kind in a deadly struggle that will decide the fate of the human race. Stylish, provocative and action-packed, “Daybreakers” stars two-time Academy Award nominee Ethan Hawke (“Training Day,” “Before Sunset”), Willem Dafoe and Sam Neill. Make-up effects were created by WETA Workshop. “Daybreakers” is written and directed by the Spierig brothers. Lionsgate and Film Finance Corporation Australia present a Lionsgate and Paradise production in association with The Pacific Film & Television Commission and Furst Films. The movie trailer for “Daybreakers” can be viewed now below. To secure your free prize pack, you must be logged into your HollywoodChicago.com Web site account. If you don’t yet have one, you can quickly register here. Having a free Web site account with a valid e-mail address is required to win this HollywoodChicago.com Hookup. You must include your first and last name, e-mail address and physical mailing address in your submission. Your personal information will not be sold or shared, will be kept strictly confidential and is only for awarding winning entries. Please answer our question below. Who would win in a fight to the death and why: a vampire, ninja, zombie or a werewolf? This HollywoodChicago.com Hookup: Film is simple: 10 lucky HollywoodChicago.com readers will be randomly selected as the VIP prize pack winners for our “Daybreakers” Hookup! The prize packs will be mailed to the winners at our expense. Good luck! Submitted by chevelin on January 18, 2010 - 7:27pm. They are bigger, stronger, faster, and nastier. Submitted by Jennifer Beedieennife (not verified) on January 18, 2010 - 7:30pm. The vampire is stronger and undead so the ninja and the zombie couldn’t touch it. Submitted by Anonymous (not verified) on January 18, 2010 - 7:32pm. Submitted by havierpotter on January 18, 2010 - 7:33pm. Submitted by loveveritas on January 18, 2010 - 7:39pm. Submitted by maroon910 (not verified) on January 18, 2010 - 7:39pm. Ninja because Ninja’s are smart and stealthy. They would wait and find the weaknesses of the zombie,werewolf,and Vampire and use it against them at the best time. Ninja’s are patient and smart, that would give them the advantage. Submitted by beanscene on January 18, 2010 - 7:42pm. A zombie can withstand a bite from either werewolf or vampire and can withstand daylight, holy water, garlic and silver bullets. And if a ninja attacked it with a sword it can more than likely revive and go after the ninja. Unlike a ninja, a zombie can never tire. Submitted by Anonymous (not verified) on January 18, 2010 - 7:46pm. Submitted by chindo on January 18, 2010 - 7:48pm. Submitted by Anonymous (not verified) on January 18, 2010 - 7:55pm.